This is going to be a love it or hate it recipe! Cauliflower and parmesan are both strong flavours on their own but bring them together and you get a deep roasted richness with a kick from the black pepper. I have never made cauliflower soup before, but I have eaten the vegetable many times in my mother’s Indian food and my father’s Italian food. Back in December I was inspired by the Hairy Bikers to bring the British cauliflower back into fashion. You may have seen my Cauliflower and Chickpea Curry recipe, but at the time I also vowed to try and make my own soup with the beautiful, cheap and underrated vegetable. Like most of my recipes, this totally reflects my cooking style. This is a cheap, nutritious and easy recipe which can be made in advance. You can also easily adapt this recipe if you don’t like certain ingredients. For example, feel free to use much less black pepper if you’re not a fan. Use pecorino or gruyère for the dumplings if you don’t like parmesan. *If you prefer a softer dumpling, use white bread; personally I prefer brown. This makes a delicious starter or light meal. 1. Preheat the oven to 150′. Place the cauliflower florets, garlic and whole black peppercorns on an oven tray and drizzle with olive oil. Roast in the middle of the oven for a total of 45 minutes. 2. I recommend that you prepare everything else after you put the cauliflower in the oven. This shortens the cooking time. So – prepare the other ingredients. 3. In a large saucepan, warm up 2 tbsp olive oil and a knob of butter. When it is warm and clear, add the diced onion. Softly cook for about 5 minutes, then add the leek. 4. When the onion and leek have both softened, add the vegetable stock and half the cauliflower leaves. Stir the pot, and leave to simmer for 10 minutes. 5. Put your slices of bread in the toaster or oven to dry out. Then, place them in your food processor with the other half of the cauliflower leaves, parmesan, parsley, and egg. Whizz it all up! 6. By now the cauliflower should have roasted for about 45 minutes. Check that it is cooked and softened. If not, leave it in the oven for 10 more minutes. If it is, you can now take it out the oven and add the cauliflower and garlic to the soup pot. Stir the soup and put the lid on. Save the peppercorns. 7. 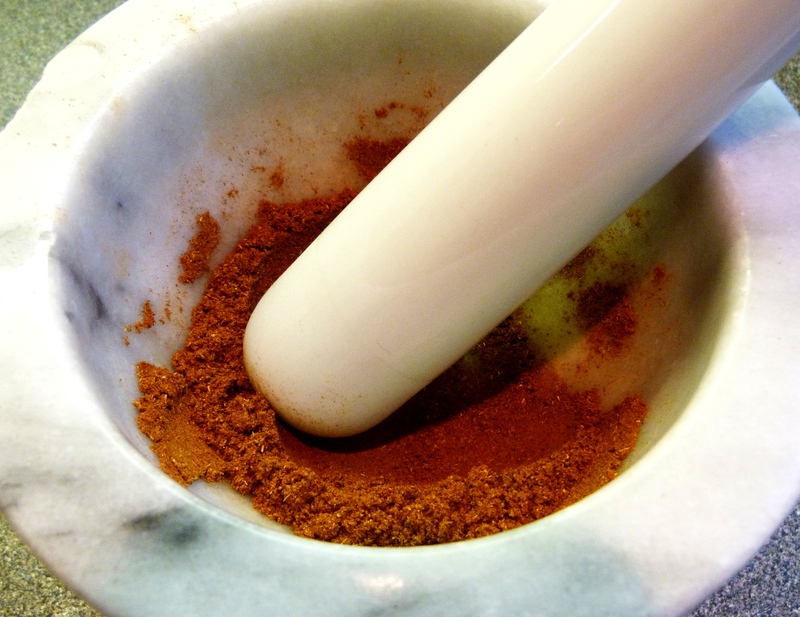 Grind the roasted peppercorns with your mortar and pestle and add a pinch to the soup and a pinch to the dumpling mixture. 8. Roll the dumpling mixture into little balls. You should be able to make 10-12. Lightly grease a tray and then cook the dumplings in the oven for 15 minutes. 9. Mash down, or whizz up your soup! Whatever machine you have to smooth it out will be fine! Stir in 3 dollops of creme fraiche and a pinch of salt to taste! 10. Serve hot with a swirl of creme fraiche and 2-3 dumplings per person. Enjoy! I would love to hear your feedback if you try it! Tip: If you like it spicy, add a pinch of smoked paprika to the soup. Posted in Recipes and tagged cauliflower, cheese, eat, food, healthy, lunch, photography, photos, soup, vegetarian. Bookmark the permalink. No I’m not vegetarian. But I like to experiment with different ingredients and health is very important to me. It is commonly said that too much meat is bad for you, and I am personally quite happy eating vegetarian meals a lot of the time. However, I will definitely eat meat when I go home for Friday night dinner and my mum has made her roast chicken! A quick, easy and cheap beef substitute is quorn mince. It is high in protein and fibre and low in fat. If you feel like you’ve had a bit too much meat recently, or you want to try out quorn, then here is a quick recipe for veggie chilli con carne. The only difference between this and a meaty chilli is the quorn and stock, so this recipe would work fine with beef mince as well, just leave it to cook for a bit longer. If you haven’t eaten quorn before, or didn’t like it last time, I dare you to give this a go. Let me know what you think. Similarly, if you often cook with quorn and have any comments or tips, I’d love to hear from you. So far, the biggest thing I’ve learnt about quorn is just that it needs just a bit more spice and flavour than cooking with meat. 1. Heat the oil in the pan and add the onion and garlic. Gently fry until softened. Add the tinned tomatoes and stock cube and cook for 10 minutes on a medium heat. 2. Heat the spices in a separate pan and then add to the pot. 3. Add the quorn, coriander, sliced pepper, lemon juice and the kidney beans and cook for a further 15 minutes. Add salt and pepper to taste. Serve hot with rice, a tortilla and sour cream. The spices that I’ve used make a delicious combination for any Mexican dish, whether it’s fajitas or burrito, or anything else. I like to make extra and keep it in a jar in the spice cupboard to save time next time! Do you like quorn? What’s your favourite way to cook it? Are you also a non-veggie who eats veggie food? Posted in Recipes and tagged chilli, chilli con carne, dinner, eat, food, kosher, lunch, mexican, photo, photography, quorn, recipe, vegetarian. Bookmark the permalink. True to my blog name, I have eaten, and now I will talk about it. I cannot believe it is September tomorrow already. The sky is grey right now and schools starts again next week. I refuse to believe that the whole summer has gone and I didn’t even get a tan or visit Brighton! One way I can cling on to summer on the last day of August is to have a yummy summery salad. I’ve just finished eating this and have the taste in my mouth that makes me want more. Alas, it is all gone. I’ll just have to have a banana instead. My last day of August salad consists of some of my favourite ingredients, including goat’s cheese, and is a great way to eat a high fibre, low carbohydrate lunch. If you don’t like goat’s cheese, you could do this with cheddar or gruyère instead. 1. Turn on the grill to 200 degrees. Slice the goat’s cheese and place on the bread. Slice the bread into 3 rectangles. 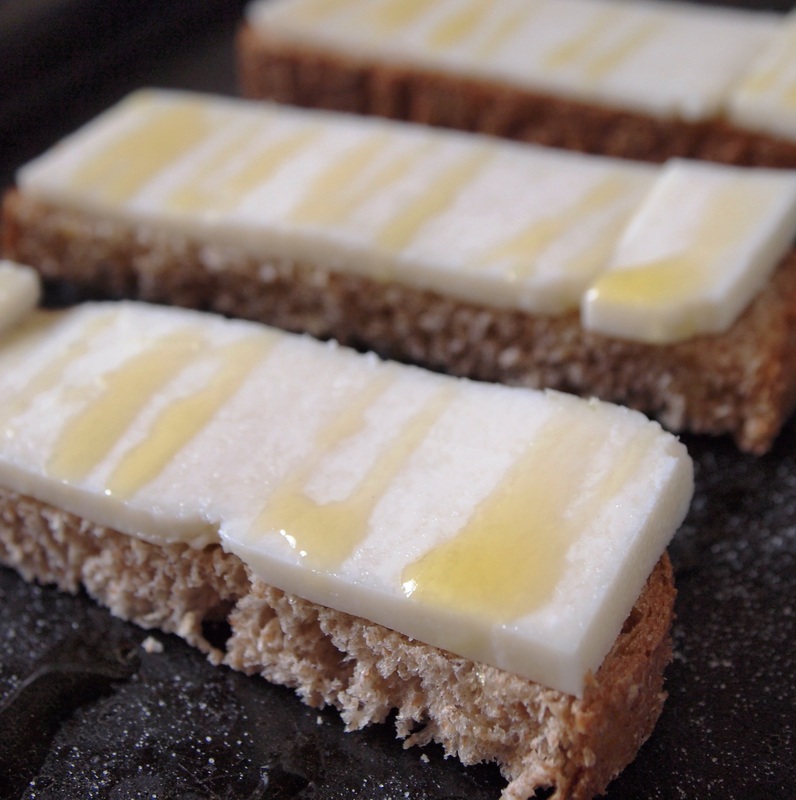 Place the crostinis on a tray and drizzle with extra virgin olive oil and salt. Place under the grill for 5 minutes or until the cheese is golden. 2. Cut the lettuce, tomato and lettuce and mix in a bowl with the rocket. 3. Shake up the dressing ingredients and add to the salad. Stir it all up. 4. 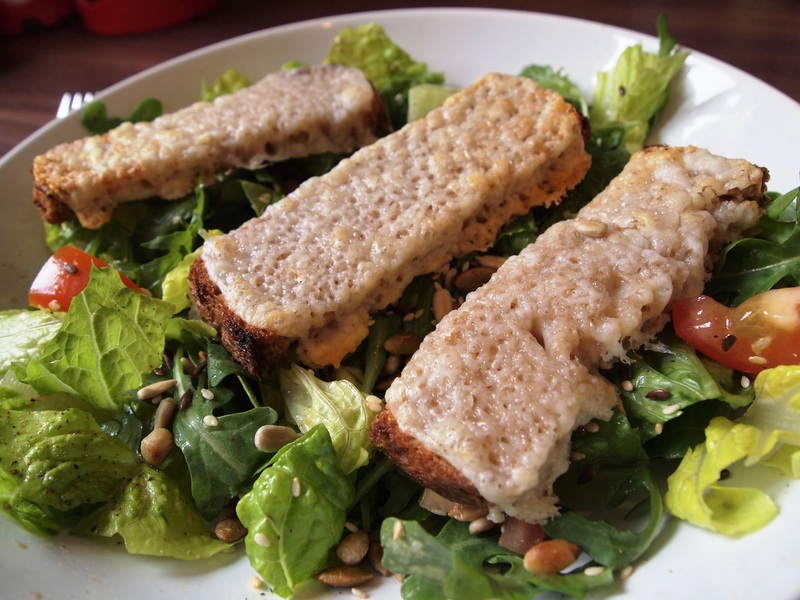 Toast the seed in a dry pan until golden and add to the top of the salad. Sprinkle salt and pepper, and then add the crostinis. Enjoy! See you at the beach? Eh me neither. Posted in Recipes and tagged cheese, diet, easy, eat, food, goat's cheese, healthy, lunch, photo, photography, salad, summer, vegetarian. Bookmark the permalink. Last week was my 24th birthday. I usually think birthdays have a compulsory anticlimactic feeling, and tend to think it was over too quickly, and I didn’t even get to eat much cake/get enough attention/lounge around in my pjs. However this year, I can truly say that my birthday was a brilliant day and I enjoyed every minute of it! When I woke up, the first thing I thought about was what to have for breakfast; bran flakes, I thought. And then I remembered, calories don’t count on my birthday! So my usual morning calorie mathematics and bowl of bran flakes were out the window and the carb overload began! The day went like this: onion bagels in the morning, followed by pizza and fried zucchini at lunch, and then foodie heaven for dinner. I met my family for lunch at l’artista in Golders Green, North London. It is an Italian restaurant, and is truly Italian all the way through. The food is great and the staff are slightly crazy, loud Italians! You cannot miss it if you are in Golders Green, just follow the scent of frying garlic! I hadn’t been to l’artista for ages, and would usually pick a new restaurant to try out for my birthday. But this year I felt like going back to our classic family-outing restaurant. When my sisters and I were growing up, we loved to go out to eat. However, my parents kept these outings to 5 times a year; once on each of our birthdays. We very rarely broke this cycle, unlike now, when I have to stop myself from eating out more than once a week! So the smell of frying garlic and pizza outside l’artista has always had very sentimental and happy memories for me. Anyway, we sat down for lunch and gave our orders to the very Italian waiter. My half-Italian dad likes to order in Italian which always makes me very proud! Being my birthday, I can have whatever I want! So I order a Fiorentina pizza (spinach and egg), but clearly the egg yolk is the best bit so I ask to have two eggs! Because I can. 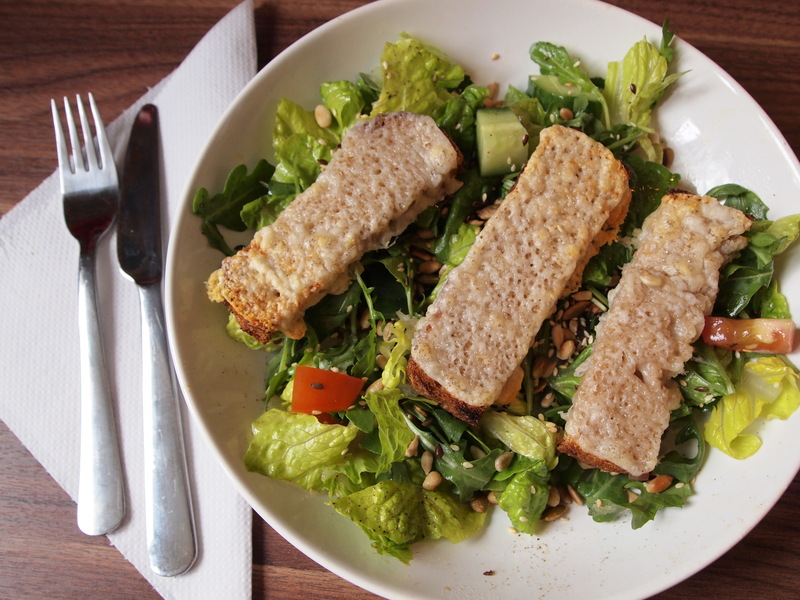 We also order a tricolore salad and some fried courgettes/zucchini to share. ‘Do you remember how we always used to come here?’ I asked my family, smiling.’Why did we always come to the same place?’ My parents thought about it for a minute. ‘Because you three all loved Italian food, and the food is good, decently priced, near home and best of all they do the birthday thing!’ Oh yes! The birthday thing! If it is your birthday all the waiters/waitresses bang on drums and other loud musical instruments and sing you happy birthday! As a child, this is a great moment of pure birthday attention! As our lunch came to an end, my dad started to get restless about needing to get to work. He started the tapping the leg and following the waiter with your eyes dance, trying to get the bill. ‘Come on’ he muttered. My mum responded with ‘Shh, we haven’t done the birthday thing yet!’ Haha, subtle. I thought they meant they hadn’t even asked for it yet, and I thought about it and about my dad needing to get to work and I said, ‘You know what? I think I’m getting a bit old for that anyway, don’t worry about it’. And just as I finished my sentence, the lights went down, the music came on, the drums came out and the waiters started singing along to the loud ‘happy birthday’ music and clapping, and the whole room turned to look at me and started clapping! I loved it! I’m definitely not too old after all! After lunch I went shopping and then came home in time for my surprise dinner from my boyfriend, Lewis. I believe that even Gordon Ramsey would have no criticism of this meal. It was so perfectly designed, executed, and presented, I was absolutely in FOODIE HEAVEN. 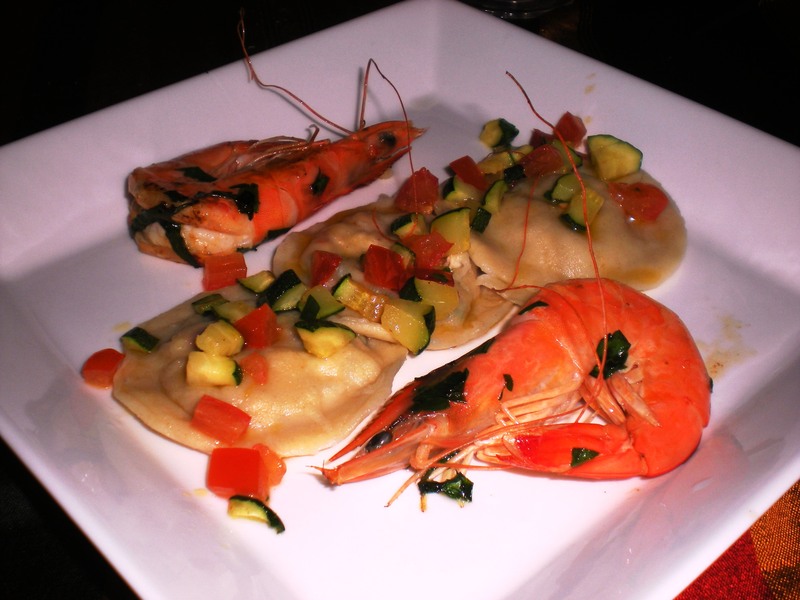 My favourite dish was home made ravioli with fresh crab and chilli prawn filling covered with courgette and tomato, and tiger prawns. It was delicious. And then came the weekend which did not disappoint. Especially as my baker sister Danya was in charge of my birthday cake. And boy did she impress me! 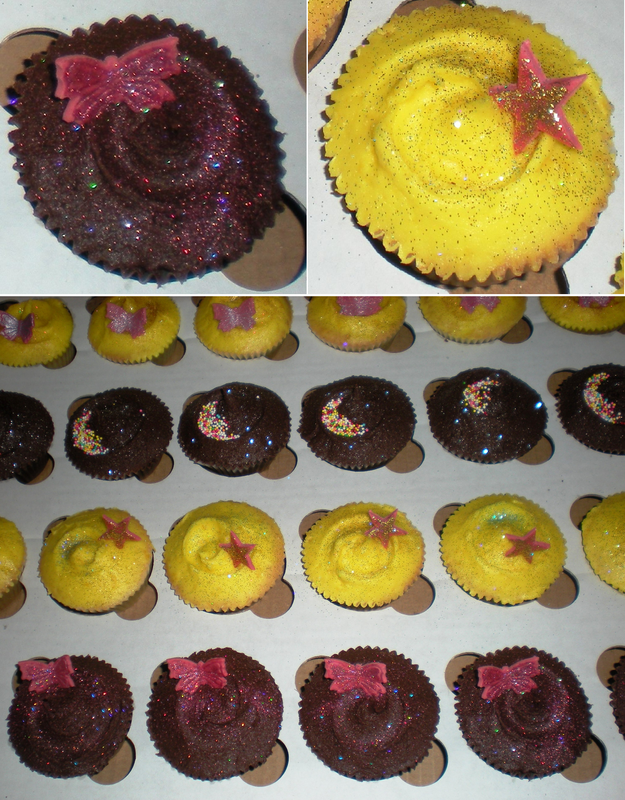 She made two types of cupcakes, lemon and mocha and decorated them all beautifully and professionally. Needless to say there is NONE left! All in all it was a great birthday. Posted in Personal, Random and tagged birthday, bran flakes, calorie, calorie counting, calories, carbohydrates, cereal, cook, cupcakes, dinner, eat, family, food, Gordon Ramsey, healthy cereal, lunch, pizza, restaurant, yummy. Bookmark the permalink. I love everything about food. I love cooking it, I love talking about it, and above all I love eating it! I’m obsessed with all things food; and that’s what my blog is about. My name is Vered, and I’m a 24 year old female living in London. I’m an ameteur cook and my love of food was heavily influenced by my parents. See my about page for more about me.